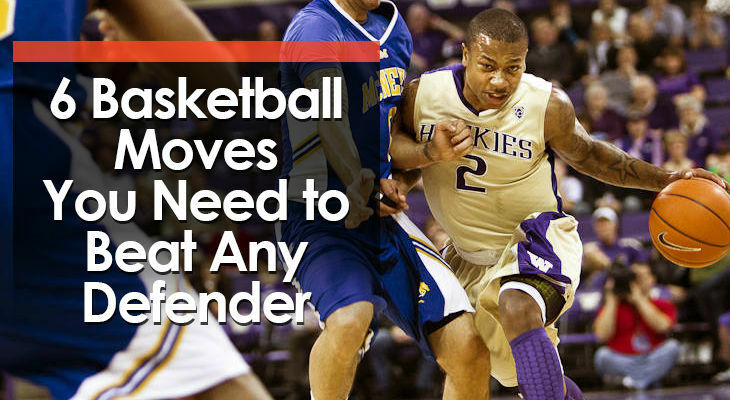 Many players believe they need complex basketball moves to be a great ball-handler. Instead of sticking to the basics, they want to learn the "advanced moves". The "double-crossover-spin-hesi-jumper” or the “triple-spin-back-cross-pullup”. By perfecting 6 fundamental basketball moves, you'll have everything you need to explode past any defender on the court. b. Fly past your opponent when you’re quickly bringing the ball up the court. Below, I’ve broken down what the 6 basketball moves are and how you can use them in a game. The crossover involves bouncing the basketball in front of you from one hand to the other. It’s most often used when a player wants to change directions and they’re not being tightly guarded by a defender who could poke the ball away. This is the easiest basketball move for players to perform, and is the first move a player will start practicing when they first start learning how to dribble. The crossover is used by players at all levels to blow past an opponent. The through-the-legs basketball move involves crossing the basketball over from one hand to the other, but putting the ball between your legs. A small difference from a regular crossover, but an important one. When the ball is passed between the legs, the front leg offers protection from a defender reaching in and also ensures the ball is further away from the defense. The timing and coordination needed for this move can make it difficult for young players, but it’s effective when players learn how to stay low and explode out of it. Similar to through the legs, the behind the back dribble allows players to switch the ball from one hand to the other while protecting the basketball. With this move, the entire body protects the ball as a player wraps the ball behind them. One of the biggest benefits of going behind the back is the ball can be passed out in front of your opposite hand which allows an offensive player to attack quickly. So if a defender lunges in to steal the basketball while on the fast break, a quick behind the back dribble can help you protect the ball and evade the defender without breaking stride. The hesitation dribble involves dribbling with speed, slowing down for a split-second, and then exploding past your defender. It’s a straight-line basketball move often used in transition to beat a defender and attack the rim or create a shot for a teammate. The goal with the hesitation dribble is to trick the defender into thinking you’re about to stop. This can be achieved by slightly raising your body, looking up to the rim like you’re about to shoot, looking up at a teammate, or a combination. With the defender losing their momentum, you’ll be able to explode past them to the rim. The in-and-out dribble move is designed to trick the defender into thinking you’re about to perform a regular crossover. This is a great basketball move for players first learning the game of basketball. Keeping the basketball in one hand, the offensive player uses a head and shoulders fake while moving the ball inside and then back out by switching the position of their hand on the ball. It’s most commonly used in transition to get a defender to shift their weight from one direction to another which opens up a driving lane to attack. The spin move is one of the most difficult basketball moves to learn, but it’s an important weapon for players to have in their dribbling repertoire. It involves planting your inside foot and reverse-pivoting around a defender while dragging the basketball with you. This can be a difficult move for young players to execute, but it’s quick and effective when a player has put in the work practicing it. It’s important that players ensure their hand stays on top of the basketball. If the hand slips under, referees will whistle the dribbler for a carrying violation. Don't try to overcomplicate it. The players who try to do "too much" are the same players who will pump fake four times, dribble six times through their legs, and then dribble twice behind their back without ever making their defender move and inch. Instead, you want to keep your basketball moves simple and effective. Mastering the fundamentals is key.